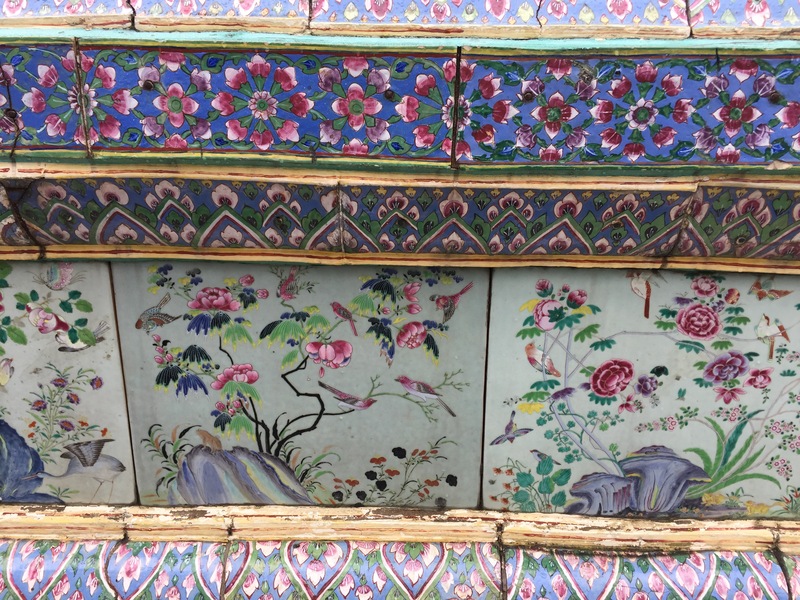 By the time you read this we will have started exploring Siem Reap and Angkor Wat in Cambodia, but I haven’t told you an almost-amusing anecdote about umbrellas, so let’s continue with Francesca’s Edited Highlights (part one is here). 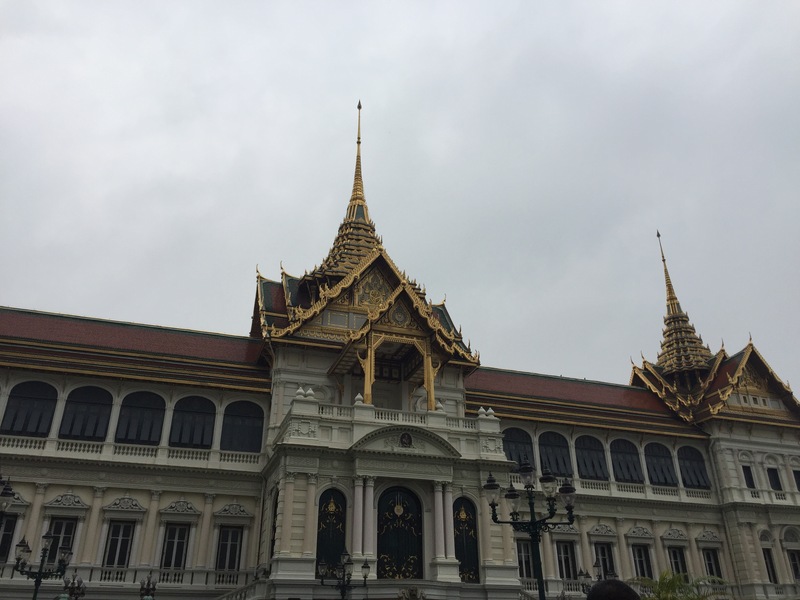 The Grand Palace, a complex of buildings which used to be the royal family’s permanent residence, is the one place everyone says you have to go when you’re in Bangkok, so we went one morning… so did everyone else in Bangkok. I’m travelling with Maxim who-needs-a-guide-just-take-photos Burke, and know little to nothing about Buddhism (and even less about Thai history) so dodging a million people in the rain – and by rain I mean HUGE DOWNPOUR – to squint up at golden pagodas through soaked glasses was a bit like walking into a chocolate shop never having tasted sugar. Everything was wonderful, but I have no idea what I was looking at. 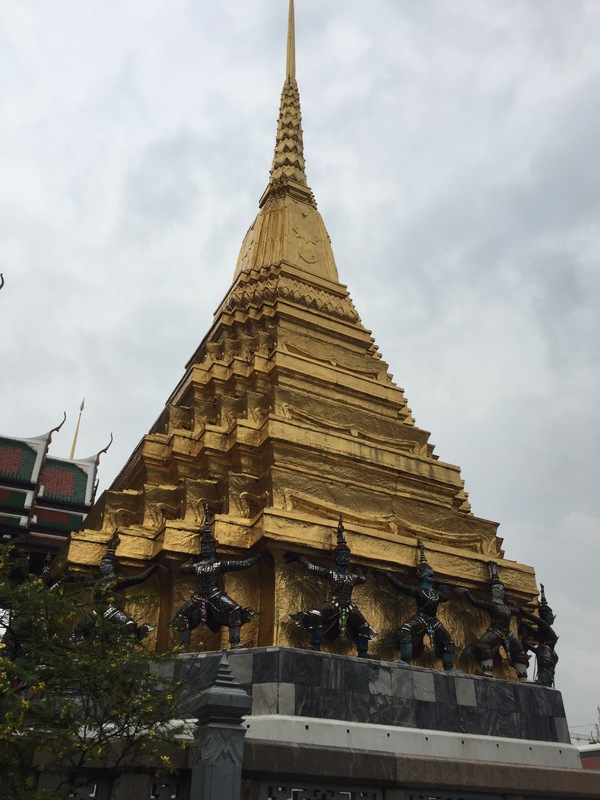 I did enjoy sitting in the Temple of the Emerald Buddha (which is not actually emerald) and searching for nirvana, but I think it’s going to take more than a few sessions on a meditation app for that. We also accidentally kept the umbrellas we borrowed from staff, and I was wracked with guilt for a few days for stealing from the Thai government, so I have left mine in the hostel. I wasn’t going to smuggle contraband into Cambodia. Wat Pho, one of about four hundred wats (temples) in Bangkok is right next to the Grand Palace, and contains a couple of hundred bronze-and-gold-leaf buddhas. We paid for a tour guide this time, who told us that the Thai name for Bangkok is the longest city name in the world, and that it means ‘city of angels’. Take that, LA. 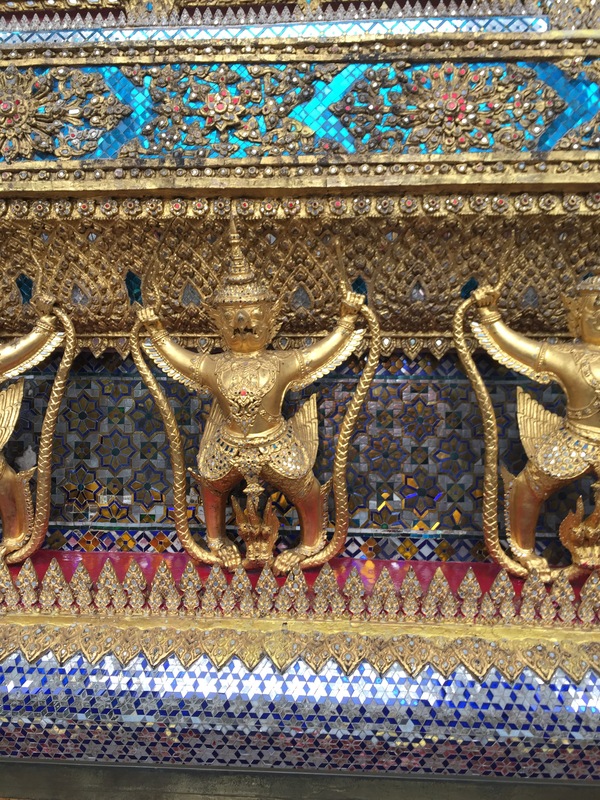 We also met, amongst others, the reclining buddha…. which really reminds me of Kate Winslet in Titanic, now I think about it. Is ‘draw me like one of your French girls, Jack’ an appropriate caption? No? You come up with one, then, because that’s all I could think. We checked it’s a real umbrella with spokes (?) and everything. I did not try to use that one. I must say, I was a bit worried about the number of priceless artefacts out in the open. What if the rain got in, or a passing child vomited? Then again I once visited a museum where a local stray would follow visitors in and curl up on the antique bed, so I guess a bit of rain isn’t the worst thing in the world. I’d still be wary of puking children, though. Khao San Road is the other one place everyone says you have to go when you’re in Bangkok, and since we’ve given the ping pong shows a miss, we did. In a nutshell, it’s like Camden Lock Market but instead of punk gear and tattoo parlours, there are street vendors with scorpion kebabs and tattoo parlours. I didn’t get any good photos, so just imagine Camden Lock, replace rain with sun and add the scorpions. The tourists were identical.